I don't normally feel all that excited about Christmas. As a child I spent the time going from Mum to Dad to Grandparents and extended family and as an adult, as much as I love my in-laws, many of them have been spent in someone else's home. We purchased our (fake) tree a few weeks ago. D chose it and opted for one with lights attached, as well as fir cones and a dusting of fake snow - I was quite surprised at how big it was but luckily we have a big living room! 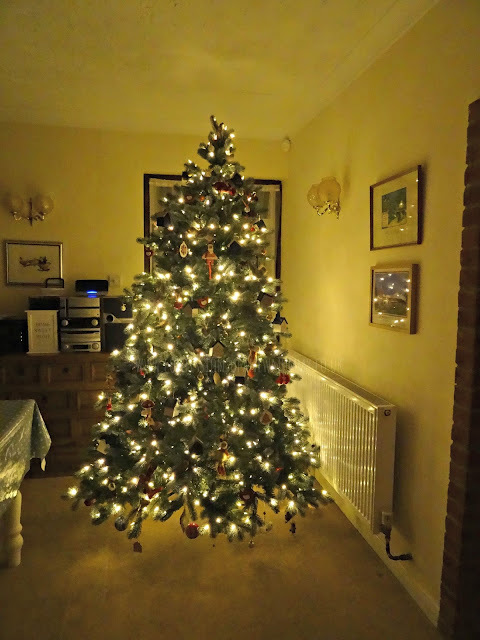 We put it up on the 28th which I think is quite possibly the earliest I've ever put up a tree but decorations had already started to creep into the living room. The Range and Wilkinsons have had some lovely and very reasonably priced decorations this year (not a sponsored plug). This year will be our first Christmas in our new home. Our first Christmas where it is just the four of us there on Christmas morning. It is also our first Christmas cooking and hosting lunch. I am starting to feel a little anxious I've not wrapped anything and other than a couple of tees, my husband hasn't got a present yet, although we only buy something from the kids anyway. Not only that, but we still haven't sat down and worked out exactly what we need to buy for Christmas Day and Boxing Day - we've got the turkey, that's the most important thing! Anyone else feeling as utterly disorganised as me?